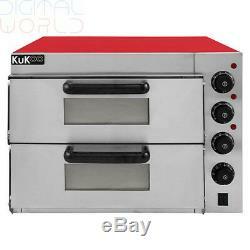 Kukoo Electric Pizza Oven with Timer &###x2F; Commercial Baking & Grilling for café or pub. 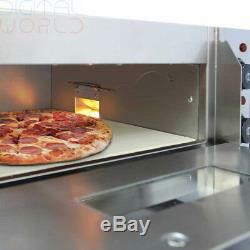 This electric pizza oven is ideal for use in a takeaway, restaurant, café or pub, reaching temperatures of 350ºC whilst the included fire stones give an even and crisp bake to frozen, thin crust, deep pan and home-made two twin decks and three separately controlled heating elements, the kitchen appliance can be used as a commercial oven or grill to bake pizza, garlic bread, ciabatta, naan, lasagne, pastries and pies. 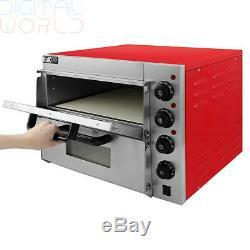 This brand new electric pizza oven can be installed immediately and as it is free standing, can be positioned onto your counter top for easy access or monitoring the baking process through the two door windows. Alternatively you can set baking times up to 30 minutes with the audible timer, which will alert you when the time is complete and you can easily check the cooking process thanks to the interior stainless steel exterior is easy to clean and maintain, whilst the straight forward heating controls ensure you achieve the perfect bake, providing temperatures between 50 and 350ºC. 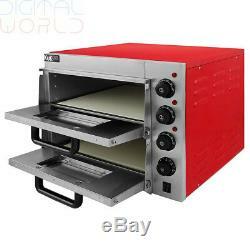 These high temperatures that the electrical pizza oven can reach are preserved thanks to the reinforced steel doors and their black handles, allowing you to open and close each deck separately. 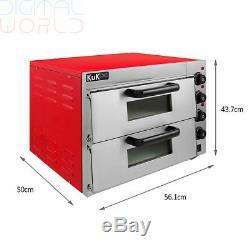 Product Features: Red electric pizza oven - Two decks with reinforced stainless steel doors - Grill or bake up to 16" pizza, garlic bread, lasagne, pastries and pies - Audible timer up to 30 minutes - Three heating elements separately controlled by three thermostats with indicator lights - Two LED lit ON/OFF switches - Two windows to view your food as it bakes - Reaches maximum temperature of 350ºCSpecifications: Width: 56.1cm Depth: 50cm / Height: 41.7cm Each chamber: 41.5cm wide x 11.5cm high Capacity: Up to 16" Power: 3kW Voltage: 220 - 240V / 50Hz Plug: 13A, 3 Pin UK Plug Temperature: Maximum 350ºC. 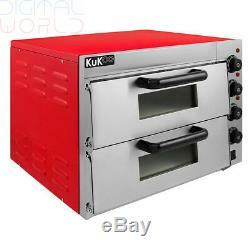 Twin deck electric pizza oven by KuKoo ideal for baking or grilling: pizza, garlic bread, lasagne, pastries. Free standing design providing temperatures between 50°C and 350°C. 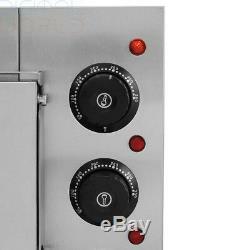 Three separately controlled heating elements. Audible timer up to 30 minutes. Package Dimensions: 64 x 59 x 50 cm. Same day dispatch on all orders placed before 1:00pm. We are not responsible for wrong or undeliverable address. 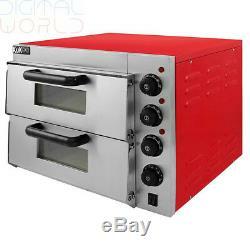 The item "Kukoo Electric Pizza Oven with Timer / Commercial Baking & Grilling for café" is in sale since Friday, January 18, 2019. 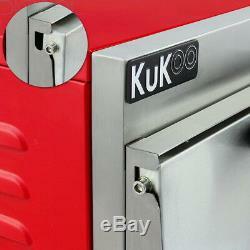 This item is in the category "Business, Office & Industrial\Restaurant & Food Service\Kitchen Equipment & Units\Ovens". The seller is "digitalworlduk" and is located in GB. This item can be shipped worldwide.